I tried something new today that I had frankly never even thought of eating before – grilled peanut butter and jelly. Don’t know why I never thought of it – after all, I like toast with peanut butter and jelly. But, grilling gives it a much richer flavor that, as Wesley Powell of Bainbridge, Georgia says goes great with a tall glass of cold milk for breakfast. Add some sliced bananas and you have yourself an “Elvis” sandwich! Powell is past president of the National Peanut Buying Points Association, which grills up these tasty morsels every year at the SPGC. He shares his secrets to making the perfect grilled PB and J in this interview. I mentioned Chet’s Peanut Butter toppings in the last post – here’s a close up of this fantastic new product for the peanut industry. It’s only been out there for about six months and already a buzz is getting started. Finding innovative new ways to market peanuts and peanut butter is the whole purpose of the Peanut Advisory Board, which represents growers in Alabama, Florida, Georgia and Mississippi. Find out more about what they do in this interview with Leslie. As growers arrive to start the registration process, they are given a cool reception – a very welcome one coming in from the Florida humidity! The Peanut Advisory Board is sponsoring the Ice Cream Social welcome hospitality, a tradition for the peanut growers meeting. It gives the meeting attendees a chance to meet and greet as they pick up their registration packets and check in to their hotel rooms. Peanut producers and their families from throughout the Southeast are arriving here at the Edgewater Beach Resort Conference Center in Panama City. It is a beautiful day to be at the beach here on the panhandle of Florida. The Gulf of Mexico is just across the street from the conference center and right out the back door of the resort hotel. Definitely a great venue for this 10th annual conference. Right now the registration room is filling up and people are getting ready to get checked in to their rooms. Registration just started at 1 pm and people are anxious to get this party started! Welcome to the 10th anniversary Southern Peanut Growers Conference. This conferences is sure to provide you with an opportunity to learn more about legislative issues, marketing and research in the peanut industry. Also, there will be plenty of time to meet new friends, spend time with your family and relax on the beach. The conference organizers have planned an informative conference. However, this conference would not be possible without all of the sponsors. The sponsors are listed to the right so be sure to visit with them during the conference and thank them for their support. Participants can enjoy refreshments and pick up their registration packets in the Hospitality Room on Sunday from 1:00 p.m. to 6:30 p.m. at the Edgewater Conference Center. The Peanut Advisory Board is sponsoring the Hospitality Room and the National Peanut Buying Points Association will be grilling Peanut Butter and Jelly sandwiches. Room registration for the event will be available from 2:00 to 6:30 p.m.
Bayer CropScience is proud to host the Southern Peanut Growers Conference Welcome Dinner. A band will be providing entertainment with musical hits from the 50’s, 60’s & 70’s. The Spouse Program will begin Monday July 14th at 9:30 a.m in the Royal Palm room of the Edgewater Conference Center. Participants will learn how to can put their best face forward with techniques, treatments, and products to give your face a younger, healthier look with demonstrations from a licensed Esthetician Tina Strickland. Spouses will also learn how to give themselves mini spa treatments from Edgewater Beach Resort’s licensed massage therapist, Jenna Beckerich. Jenna will cover things that spouses can do at home with techniques, treatments, and products to smooth over rough feet and hands. Each lady will receive a 20% off coupon to use at The Spa at Edgewater. Participants will also be able to take advantage of shopping at Pier Park. Register for Monday’s spouse program on the registration form. The evening of Tuesday, July 15th is the Night of the Blues. Syngenta is proud to host the Southern Peanut Growers Conference Tuesday night Dinner and Entertainment. Join us in the celebration of the final event of the 10th anniversary conference in blues style! Don’t forget to wear black pants and white shirt. We will supply the rest of your outfit! Kidz Klub programs are offered through Edgewater Beach Resort. Advance registration for children is required. Events range from scavenger hunts, hula contests, kite flying on the beach and crafts. Kidz Klub is available for children registered for the conference on Monday, July 14, 9:30 a.m. until noon. Pre-registration is required for Kidz Klub. Contact Edgewater Beach Resort for more information at 1-800-874-8686. 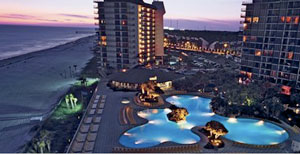 The 10th Annual Southern Peanut Growers Conference will be held July 13-15, 2008 at the Edgewater Beach Resort in Panama City Beach, FL. This year’s conference offers farmers an opportunity to learn more about the legislative issues, peanut research and promotions. In addition to the conference sessions the event focuses on the family by offering a kids program and a ladies program. The kids and ladies program will be similar to previous conferences. There will also be a golf tournament on Tuesday afternoon.